I hope I never lose the burning desire to learn more about natural history. I knew that Mother Nature could be quite the designer but I learned some new things at the Wildlife Diversity Conference this week. Things that tell me she has quite a few more tricks hiding up her sleeve. From discovering how nonnative earthworms are detrimentally impacting our forests to learning what is down in a terrestrial crayfish tunnel….It was great. Sponsored by the Ohio Department of Natural Resources’ Division of Wildlife, this annual conference draws nearly 1000 people to hear researchers who are tops in their fields. Consider attending next year. You won’t regret it. Did You Know? 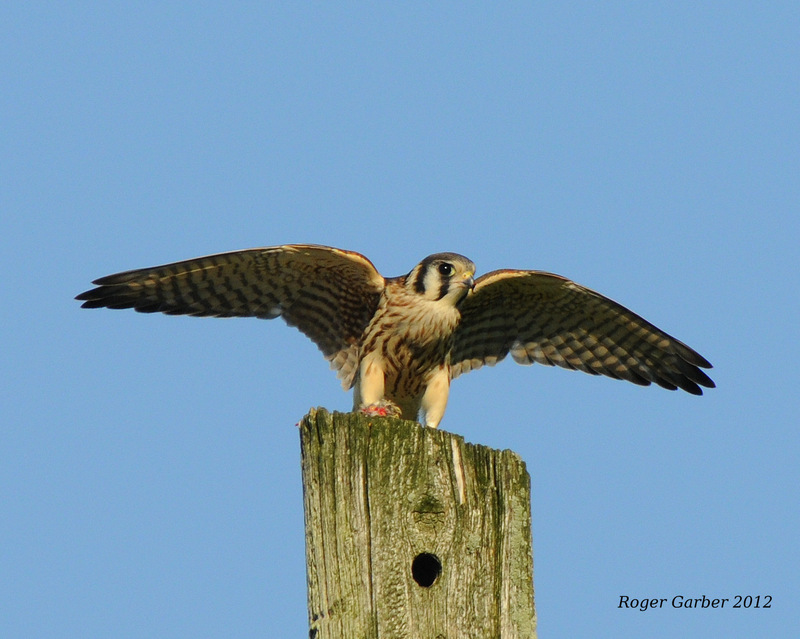 The American Kestrel (Falco sparverius) is the smallest of our falcons. About the size of a Mourning Dove, they can frequently be seen sitting on a power line or telephone wire or hovering over a field just waiting to pounce on an unsuspecting meadow vole or grasshopper. It goes without saying that raptors (hawks, falcons, eagles and owls) have great eyesight but here’s something even more unusual. 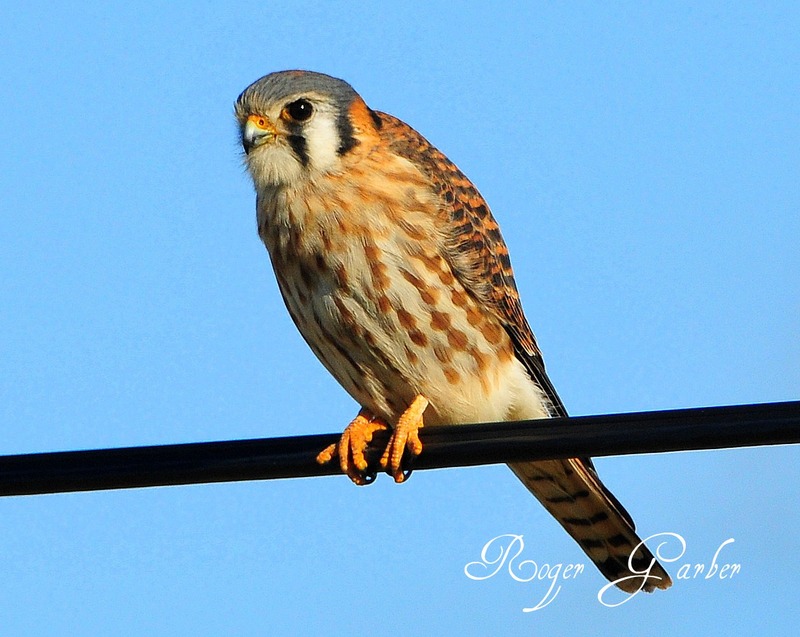 Because kestrels can see ultraviolet light, and because vole urine reflects that color, it’s possible that kestrels can follow vole urine trails to potential prey. Go figure! Thank you to our friend Roger Garber who kindly provided some of his spectacular photos for this post. Now in its sixth consecutive year, the popular Wildflower Pilgrimage is a weekend event hosted in southern Ohio celebrating one of Earth’s greatest natural spectacles – the grand showcase of wildflowers gracing the world’s temperate forests in the spring. Located at the southern edge of the glacial advance, and also occupying the edge of the Appalachian foothills, this region has one of the richest wildflower displays to be found in America’s Eastern Forest. The Wildflower Pilgrimage is timed to catch the blooming of many of the showiest species and will be held April 20-22. Check it out HERE. The area garden centers are BURSTING with a riot of colors and fresh new ideas to get you in their doors and out in your garden. Grandma’s Gardens and Landscaping (Centerville/Waynesville) is celebrating with their Spring Preview Open House March 9-11. Knollwood Garden Center (Beavercreek) has already started their spring series of seminars. This Saturday, March 10 at 10 am is “Spring Tonic: Early Vegetable Gardening”. Call the store to register at 937-426-0861. Meadow View Growers (New Carlisle) also has a list of upcoming seminars. Check them out HERE. Siebenthaler’s (Centerville) is having a Potato Planting Party. Check it out HERE. This past Saturday I traveled to Cedar Bog Nature Preserve, just south of Urbana (OH) in Champaign County for a Raptor Workshop led by the amazing Tom Hissong, education coordinator for Aullwood Audubon Center. 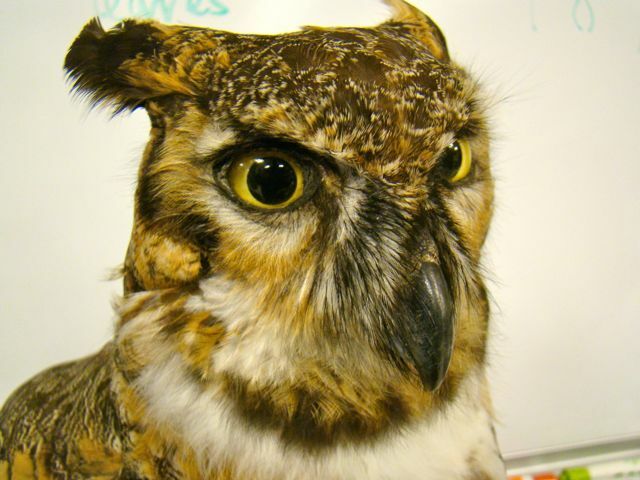 Participants were schooled on the numerous hawks, eagles, falcons and owls that can be found in at Cedar Bog as well as around Ohio. Cedar Bog is an Ohio Historical Society property that is managed by the Cedar Bog Association. The bog is the largest and best example of a boreal and prairie fen complex in Ohio formed by retreating glaciers about 15, 000 years ago. It is home to many rare, unusual and endangered plants including the Small Yellow Lady Slipper and Showy Lady Slipper orchids. The 450-acre site features a one mile long board walk and an eco-friendly nature center, which was the location for the raptor workshop. Weird one that I am, I thought the highlight of the workshop was the opportunity to dissect an owl pellet. Less you are grossed out by this thought, would it soften the weirdness to know that the pellets were sterilized? Hmmm. I didn’t think so. Anyways, owls, as you may know, hunt and eat small animals like shrews, mice, voles and birds. They tear their food and swallow large chunks whole. 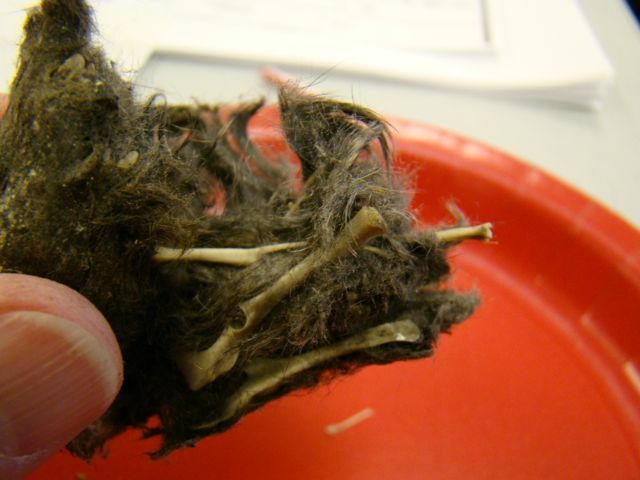 They can’t digest all the hair and hard materials such as bones, so they regurgitate these in the form of a pellet. Sounds like an owl version of a cat’s hair ball! 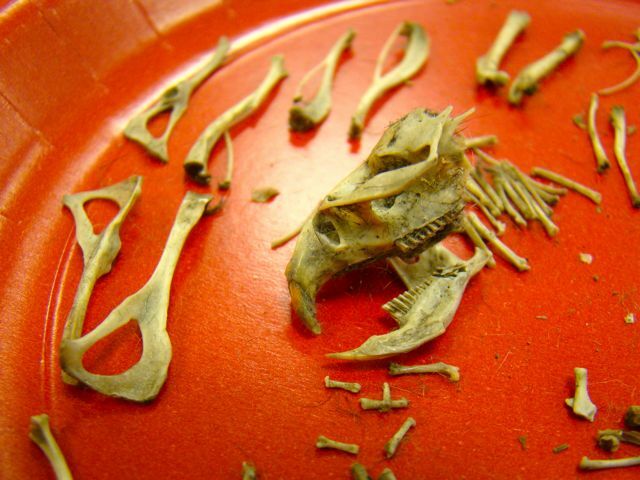 Bones found in an owl pellet. The tiny bones just under the jaw are less than 1/4 inch. Using a bone sorting chart (yes, there is such a thing) we discovered teeny, tiny vertebrae, ribs, shoulder bones, leg bones, sculls and teeth. It was quite interesting. It bears repeating: do yourself a favor and discover the wonders of nature by taking the opportunity to check out some of the wonderful places like Cedar Bog. You won’t be disappointed. 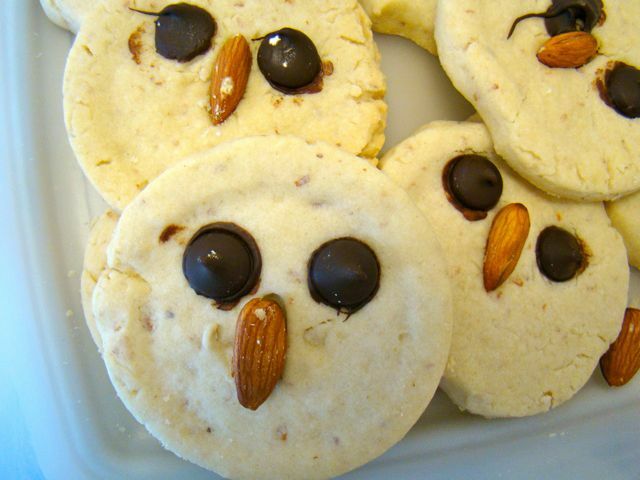 Yummy shortbread owl cookies. Who says birders don't have a sense of humor? Knollwood Garden Center – Beavercreek – Knollwood is really getting in some great and unusual house plant in stock. Just in time for Valentine’s Day (though who REALLY needs an excuse to buy a plant?) all tropical foliage plants are 20% off through the 18th. (Flowering plants not included.) Website HERE. Grandma’s Gardens – Waynesville/Centerville-ish – Grandma’s Gardens website has a $5 off a $30 purchase of regular priced items (some exclusions) through Wednesday, February 15. Coupon HERE. No snow? No problem – Snowdrops are here! 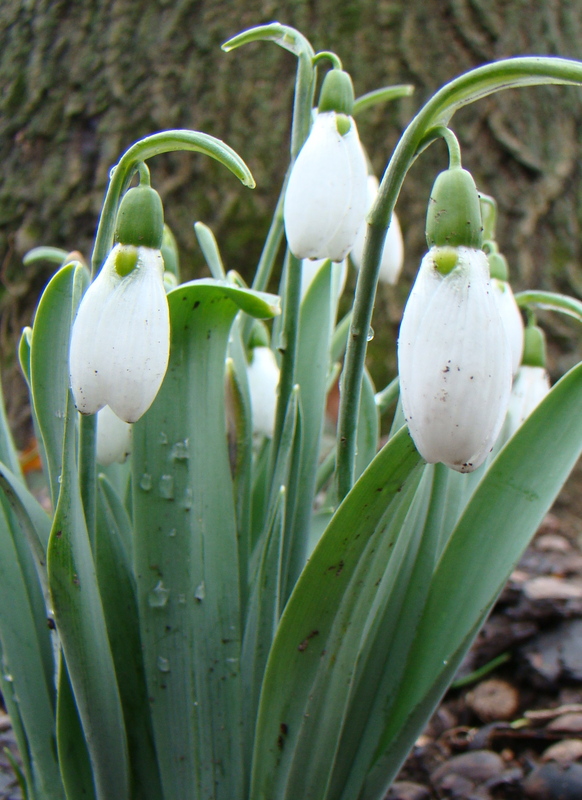 An early blooming harbinger of spring is the lovely Galanthus nivalis, commonly known as a snowdrop. These European native perennial bulbs are in the Amaryllis family. Another common name of milkflower may find its origin in the translation of Galanthus: ‘Gala’ is Greek for ‘milk’ and ‘anthos’ is Greek for ‘flower’. Would you like to join a group that really needs your help? It will give you the opportunity to learn about Ohio history and native plants. You’ll make new friends and make a difference…. Curious? You are invited to join the Friends of the Ohio Governor’s Residence and Heritage Garden and become a Docent, Garden Guide or Governor’s Gardener. Saturday, February 18: Terrarium Workshop ‘Tiny and Terrific’-10am: At this free seminar, learn how to make a terrarium. After the demonstration, feel free to make your own! Bring your own container or find one in the store. Planting medium is provided for a $7 fee. Plants can be purchased at the workshop. Registration is required. Call 426-0861. 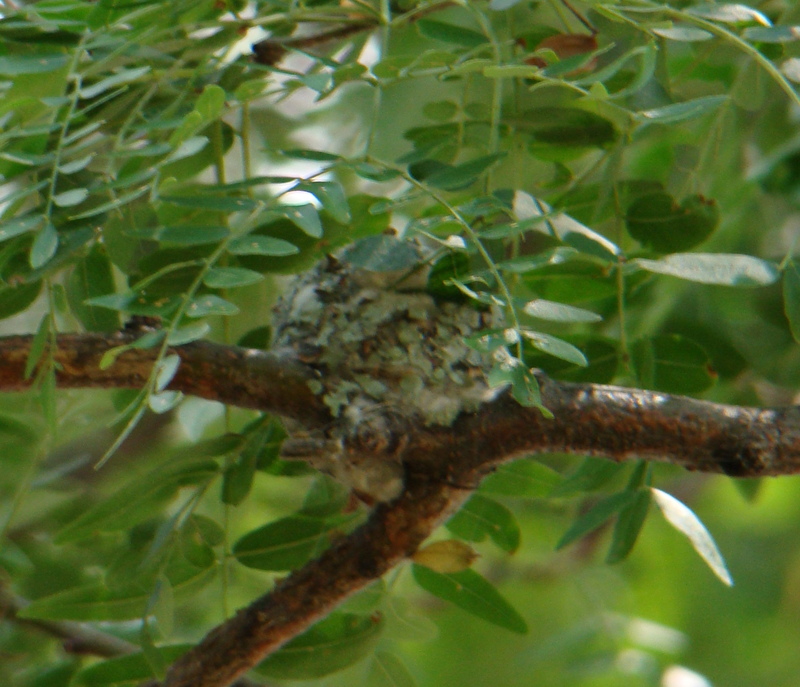 Saturday, March 3: Kid’s Club-10:00 am: Discover the “Lost World” garden. Create a mini garden that any dinosaur would love to roam through. All materials supplied. Cost is $5.00 due at time of registration. Register by Feb. 27. Call 937-845-0093. What’s New in Annuals and Perennials 2012-10:00 am: This colorful power point presentation will give you a birds-eye view of Meadow View’s newest offerings for spring 2012. Cost is $5.00 due at time of registration. Register by Feb. 27. Raised Beds and Rain Barrels- 2:00 pm: Learn the advantages and ease of gardening in raised beds and see with a step-by-step instruction on how to build a rain barrel. Cost is $5.00 due at time of registration. Register by Feb. 27. Saturday, March 10th: “Bark, Buds, and Leaves; The Beauty of Trees”- 10:00 am- Join Chris Jensen from Wegerzyn Metro Park for an exciting discussion on the glorious nature of trees. Cost is $5.00 due at time of registration. Register by March 2. “Garden Art-Create a Glass Totem”- 10:00 am- “Repurpose” your old glassware into a unique piece of garden art in this hands-on-workshop. Comb the cupboards, thrift stores, and garage sales for the perfect piece. This project has been featured in ‘Birds and Bloom” and “Garden Gate” magazines. Bring your own glass or purchase pieces during the workshop. Fee is $20.00. A $10.00 deposit is due upon registration. Register by March 2. “Create a Miniature Garden”- 2:00 pm- Miniature gardening is the latest trend. Create the perfect replica of a real or fantasy world on a miniature scale. 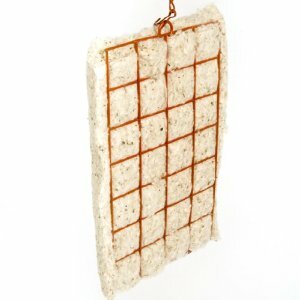 Cost is based on materials used. Deposit of $10.00 is due at time of registration. Please register by March 2. 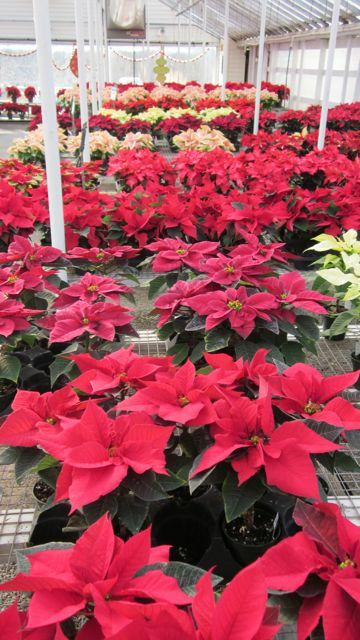 One of the prettiest sights of the holiday season just might be a greenhouse growing range of poinsettias at their peak. Joel Poinsett, ambassador to Mexico in the 1820s, is generally credited with introducing the poinsettia (Euphorbia pulcherrima) to the U.S. He had the foresight to bring specimens back to his South Carolina greenhouse. In Mexico, its native home, the poinsettia is a perennial shrub that can grow to ten feet! The beautiful red, white, pink and variegated bracts are not flowers at all, just colorful leaves. The true flowers of the poinsettia are located in the center of the bracts at the tip of each stem; they are those little tiny yellow blobs that can easily be overlooked. Many say that the poinsettia is poisonous. Though the plant leaves and stems do ooze a milky, white sap when broken, the toxins which contain diterpene esters, vary by variety. An Ohio State University study reported that, if ingested, the plant may only cause some stomach discomfort. The sap may cause some skin irritation and you definitely don’t want to get it in your eyes. Ok. Call me a chicken, but I’m not going to test the validity of this report. It would be wise to keep them out of the reach of children and pets. 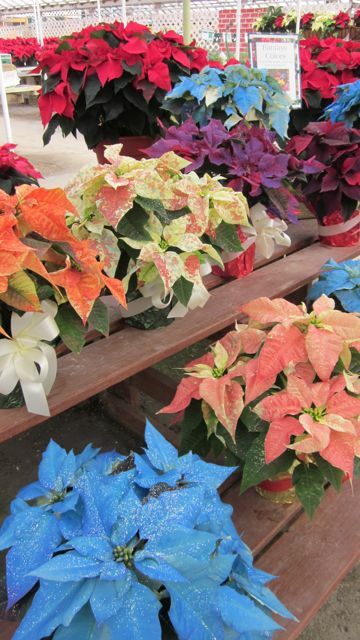 There are hundreds of different colored varieties on the market right now. 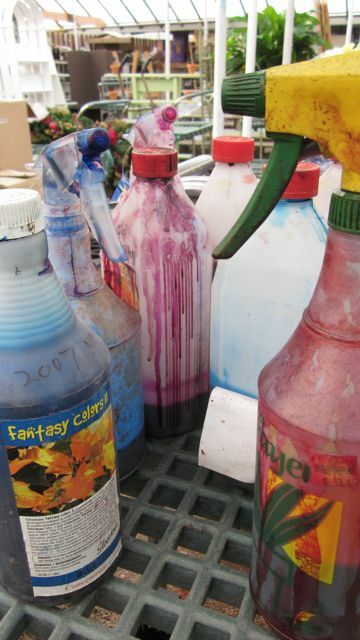 If you frequent a quality garden center, they should even have the varieties noted by name. Say you’ve seen blue poinsettias in the stores? You can’t blame the sightings of blue poinsettias on that eggnog you’ve been drinking. Here’s the scoop on the behind-the-scene magic! 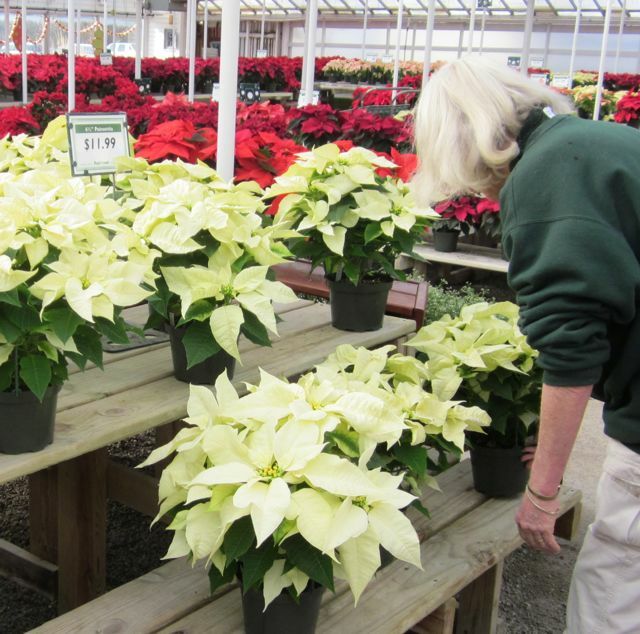 The grower will take one naturally grown white poinsettia, some commercial plant dye and spray until the desired color is reached. Blue, pink, burgundy, orange, yellow…. 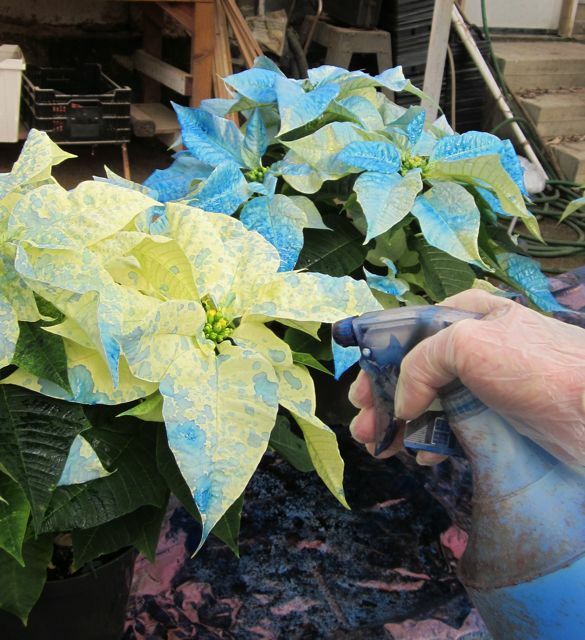 For purple, just spray the blue dye on a naturally grown red poinsettia. I learned something really neat: the dye can be used on other plants such as Euphorbia ‘Diamond Frost’. ... and, tada! 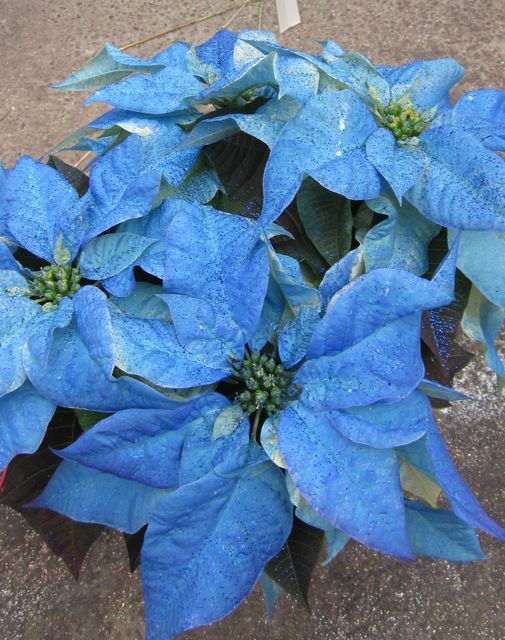 A blue poinsettia. 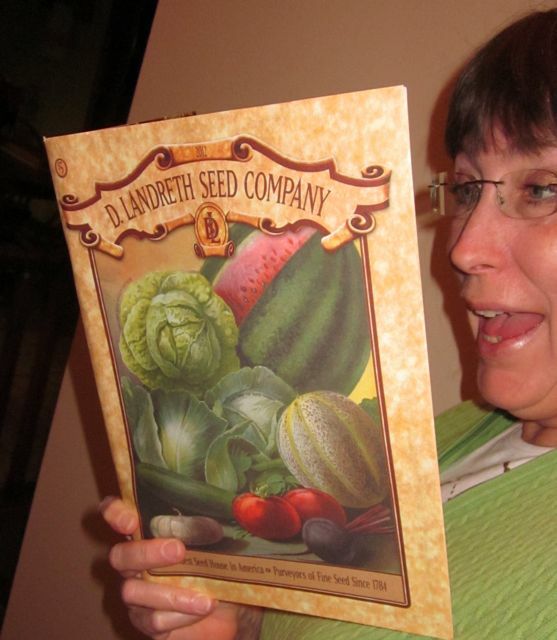 As I mentioned a while back, the D. Landreth Seed Company, the oldest seed company in the U.S. (since 1784! ), is in financial troubles. The company is not out of the woods yet but the sale of their 2012 catalog goes a long way to preserve its future. I ordered 4 and should have ordered more. It’s WAY more than a seed catalog – it’s U.S. agriculture history in your hand. If you haven’t ordered your catalog yet, you’d better get on the ball before they sell out. Check their website out HERE. Taken from the famous Buffalo Springfield 1966 song “For What It’s Worth” the lyrics in my blog title are so appropriate. Something BIG is happening to mature Austrian pine (Pinus nigra) trees all over the Centerville-Washington Township area. 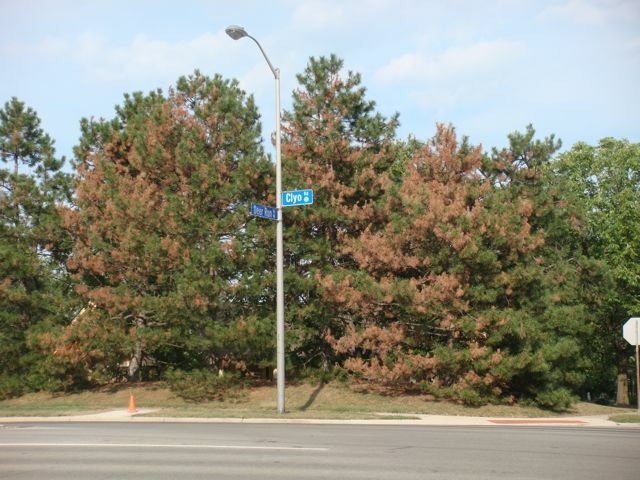 Have you noticed these large long-needled conifers dying in your community? 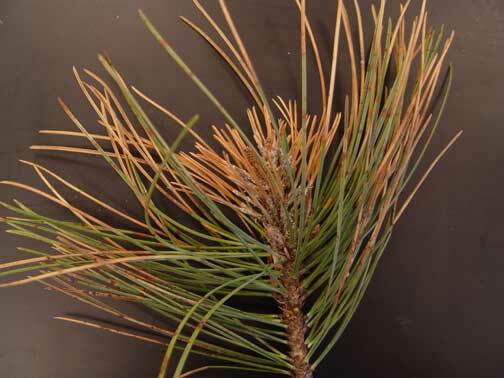 According to the ODNR’s Division of Forestry the Austrian pine is the pine most susceptible to Diplodia Tip Blight, a fungus that commonly attacks mature trees that have been stressed. And these trees have seen stress! This menace will slowly kill the tree over several years and wreak havoc in mass plantings as it spreads to surrounding trees. If it was present last year, I must have been oblivious. THIS year….. it is everywhere. Just drive down Clyo Road around Alex-Bell. Or check out I-675 between the Centerville and Wilmington Pike exits. I what I see from my car is any indication, we’re on track to soon lose thousands of pine trees. Even though the Austrian pines are fast growing they are not long-lived trees and are often mixed in with spruces and deciduous trees in new plantings. When the Austrians die off, the spruce and deciduous trees are still there. Regional Urban Forester Wendi Van Buren notes, “A telltale way to determine of a tree is infected with Diplodia tip blight is to look for the signs of the pathogen, which consist of tiny black, fungal fruiting bodies (pycnidia) that are formed on the surface of the infected needles and cones.” Read more about it HERE on this OSU extension fact sheet. I attended the perennial seminar at Knollwood today and came home with 4 new perennials!! Don’t miss out on Knollwood’s next seminar, Saturday, September 3 at 10am and again at 11am at St. Luke’s Catholic Church for: “Learn to Plant Like the Pros”. Learn as John Scott narrates as the landscape crew installs a job from start to finish. Space is limited and reservations are required. Call 937-426-0861. “Clip and Cook With Herbs” Learn how to harvest and dry a myriad of herbs or make a culinary wreath at the Thursday, September 8 seminar (Centerville garden center location) at 10 am or 6 pm. Event will repeat at the Beavercreek garden center at 1 pm on Saturday, September 10. 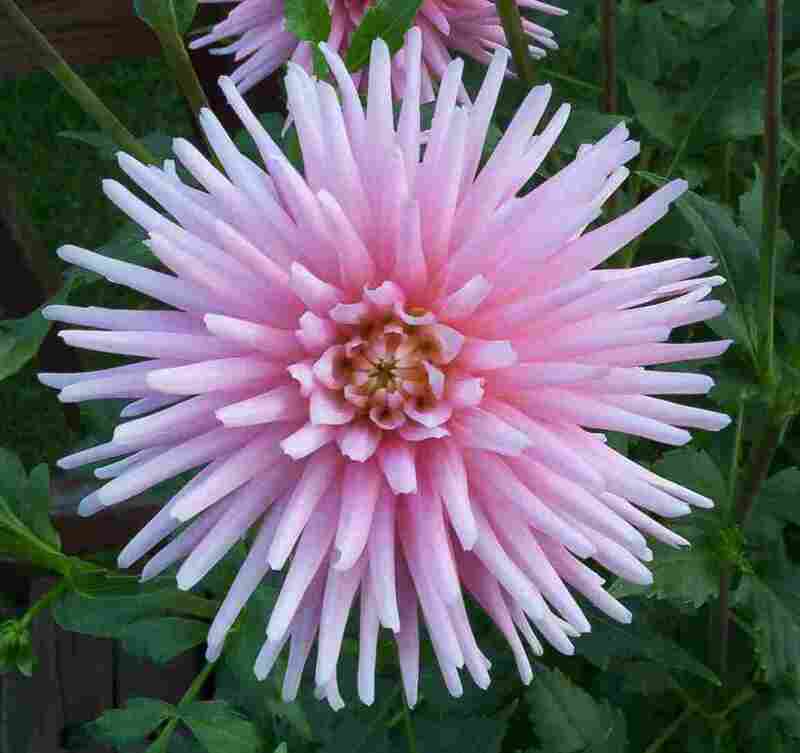 The Greater Columbus Dahlia Society will hold their 46th annual dahlia show September 3 & 4 at the Marysville Family YMCA and Ohio National Guard Armory Facility in Marysville (1050 Charles Lane, Marysville OH 43040). This is a free event. One of the poolside visitors. It’s always fun to escape from the everyday routine and last week was no exception. Our vacation to Hilton Head Island, SC offered a whole ‘nother natural world to discover. 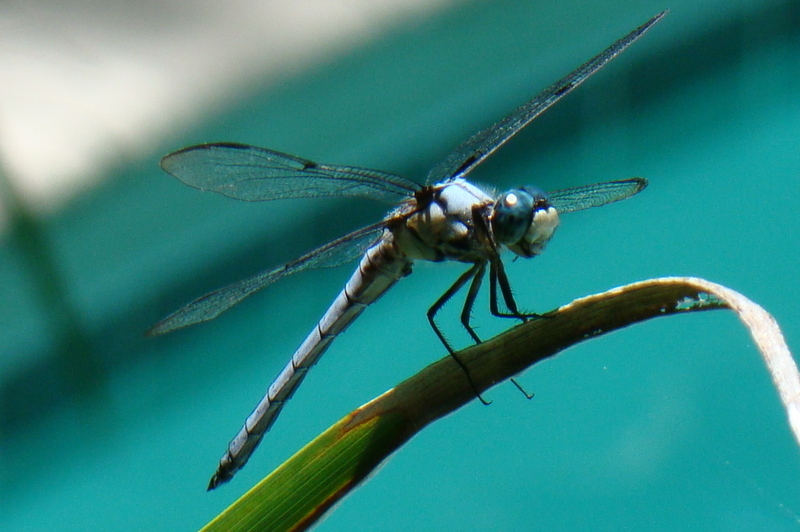 Dragonflies were abundant as well as birds that we don’t see ’round these parts. A highlight for me was a Swallow-tailed Kite, a black and white raptor, not the kite with a string you fly on the beach! However now that I am home, there are lots of educational opportunities and sales events to report on so let’s get to it. 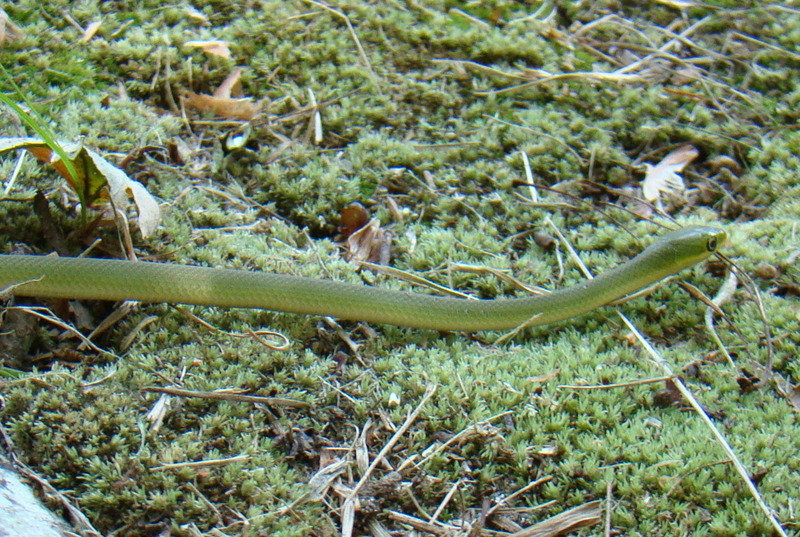 Who says snakes aren't cute? This one is about 8" long. Note the moss for a size reference. Knollwood Garden Center is featuring Rich Pearson of Five Rivers MetroParks this Saturday, August 6th at 9:30 am. He will offer tips on how to keep your mid-summer gardens producing at their best and what to do with the great produce to save it for future use. Such as: freezing, drying, freezer salsa, refrigerator pickles (no canning!) and more. Bring the kids out to Koogler Wetland/Prairie Reserve from 10-11:30 am, Saturday, August 6, in Beavercreek Township to learn about insects while playing Bug Bingo! Under the direction of Beaver Creek Wetlands Association (BCWA) Trustee Chris Simmons, tromp through the prairie shaking bugs from the wildflowers onto catching sheets and get a closer look-see in magnifier boxes. Volunteers will assist with identification. Those who successfully complete their Bug Bingo card will proceed to the “Edible Entomology” station, where they can create an insect from tasty treats. They can eat their creation if they can identify the basic parts of an insect. Nets, collection boxes, identification guides, and treats provided. Dress appropriately – long pants and closed-toe shoes are recommended. Koogler Wetland/Prairie Reserve is located on the southeast corner of Beaver Valley and New Germany-Trebein Roads. Please contact BCWA at 937-320-9042 or by E-mail at admin@beavercreekwetlands.org for more information. Not slighting the men (after last post’s note on a Women’s Day event) Siebenthaler’s Nursery is offering a Men’s Morning, Saturday, August 6 from 8-9:30 am at the Centerville Garden Center ONLY. Men can enjoy breakfast cooked on the grill and hear helpful lawn tips from Len Dunaway of Green Velvet Sod Farm. Robert and Jeff Siebenthaler will discuss the latest Emerald Ash Borer news. This program is also free, but you need to make a reservation. Register by contacting Laurie Fanning at: lauriefanning@siebenthaler.com; 937-434-1326 or 937-427-4110. The Greater Cincinnati Master Gardener Association is offering “A Case for Native Gardening: How You Can Sustain Wildlife with Native Plants” and is presenting Dr. Doug Tallamy, author of Bringing Back Nature for two speaking engagements on August 7. Tickets and more information can be found HERE. The guest speaker for the 7 pm, Tuesday, August 9 meeting of the Miami Valley Hosta Society which meets at Cox Arboretum is Barbara Bloetscher, Ohio State University. For over 20 years she has had a close association with OSU and now serves as diagnostician for environmental and nutritional problems on agronomic crops and turfgrass. She also is the State Entomologist/Apiarist at the Ohio Department of Agriculture. Her specialty is turfgrass but she also is a recognized expert in identifying weed and herbicide injury on crops and ornamentals. The event is free. Just what is a Plant Trials Day? It is a day for people who love plants! It is a view of the Cincinnati Zoo & Botanical Gardens Trials, including annuals, perennials, grasses, bamboo, shrubs, vines and trees. Industry professionals in these categories will be sharing their best new varieties. Featured speakers include: Jim Nau, Manager of The Gardens at Ball at Ball Horticultural Company; Bill Hendricks, President of Klyn Nurseries with one of the largest selections of plants anywhere in the country and Paul Cappiello, Executive Director of Yew Dell Botanical Gardens and Coauthor of the Book “Dogwoods”. The event is $45 and lasts all day and includes a catered lunch and reception and a Silent Auction for rare and outstanding plants. Find more information HERE. If you are serious about learning more of the natural world around you, check out this branch of the Arc of Appalachia Preserve System HERE. Upcoming in-depth on-site schools include Butterflies of the Forest Heartland (August 22-26) and Trees of the Eastern Forest (September 18-23). Grandma’s Gardens and Nursery: Sunset Specials from 6-8 pm, now through August 5. Aug. 2: Buy one shrub, get 2nd 50% off; Aug. 3: All gallon and larger perennials, buy two, get one free; Aug. 4: Half off one regular tree planting fee; Aug. 5: 30% off regular priced in-stock fountain. Now through August 14: all daylilies and Asiatic lilies are 30% off. Knollwood Garden Center: 20% Off all trees and shrubs, 25% off all perennials (gallons, $12.99 & up), 50% off all quart-sized perennials ($6.59 & up). Groundcovers not included. Fountains and furniture 30% off. Siebenthaler’s: Siebenthaler’s 61st Annual Tree & Nursery Sale is scheduled for September 24th & 25th and October 1st & 2nd.